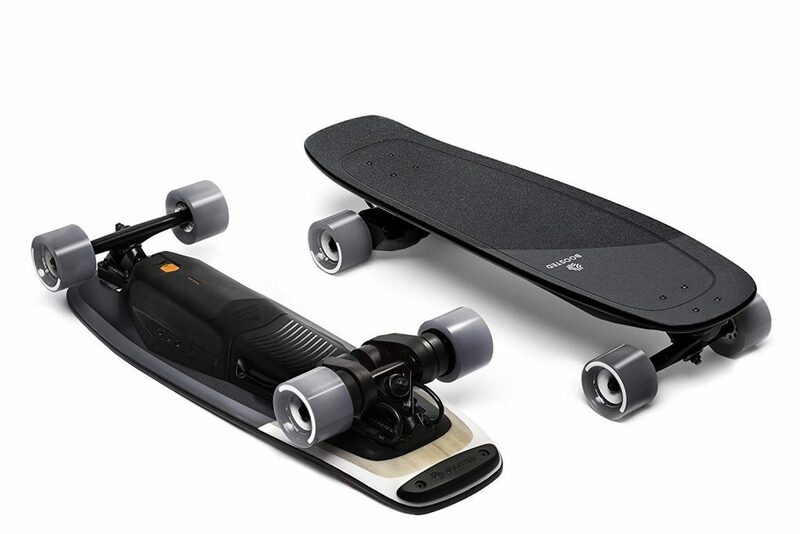 The Best Electric Skateboards of April, 2019 – The Top 5 Revealed! Electric remote-controlled skateboards are trending mainstream. These boards have become more complex and sophisticated. Think sleek design, powerful motors and immaculate control. We’ve listed boards below fitting the needs of even heavyset guys, with features like the sturdiness to ride over boulder-sized rocks and the longevity to travel a few miles into town. Read on for the Top 5 Electric Skateboards stirring the skate scene in April, 2019. Looking for the ultimate board for seasoned skaters? The premium Boosted board fits the bill. Let’s start with the build. The Boosted Stealth comes with a Super Flex composite deck, the same ingredients that make up the best long boards and snowboards on the market. 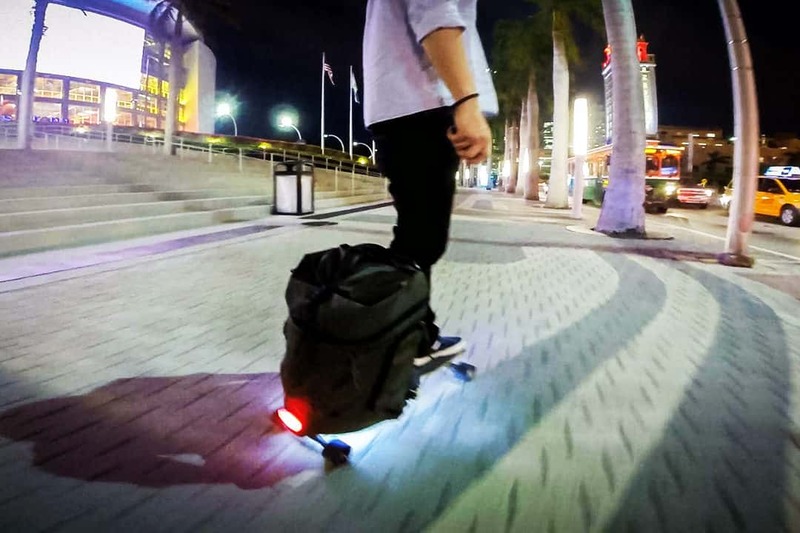 This electric board has a top speed of a whopping 24mph and a range of 14 miles per charge. This figure will differ slightly depending on the hill gradient and the terrain, as well as the wheels that you use. Speaking of hill gradient, the Stealth can tackle hills insanely steep – up to a 25% gradient. That makes this electric longboard the only choice for ALL terrains. Other than that you get multi-speed control and state of the brakes. Everything works lightning fast and you’ll never feel like the board is about to fly out from under your feet. There’s nothing to be concerned about with this electric board. It’s crafted by experts for serious skateboards who are ready to take their ride to the next level. We love the Boosted Stealth. The design is well-thought-out, and gives you just enough space to see the pavement in front of you. It will easily accelerate and climb hills. The powerful regenerative brakes will bring you to a dead stop without making you fall. It’s easy to grab and go, so you can practice in the streets and the park. With this board you’ll be a pro skater in no time. Worth every cent. So sleek, so thin – a skating beauty to behold. The general consensus is that electric boards have a way to go before they look as slick as their non-powered counterparts. This Teamgee board changes all of that. The graphics on the deck are some of the coolest we’ve seen. And that’s just the start: The luxurious 11-ply maple wood deck itself is beautifully narrow, a testament to the workmanship of the manufacturers. It’s definitely not style over substance; this durable board can go over handle pretty much any terrain. Otherwise, it comes with everything you would expect. An easy wireless remote that will accelerate you to around 22mph with a range of 11 miles and 20 degree gradient hill climbing power. This board can be operated with one touch, meaning that you don’t have to ‘control’ the controller at all times. Another selling point is that this board is fully adjustable for all riders. Novice riders should take extra caution, this board will accelerate fast and break hard – so it’s best suited for relatively experienced riders. All in all, an amazing board - one of the most modern we've had the pleasure of cruising with and one that I'd highly recommend. 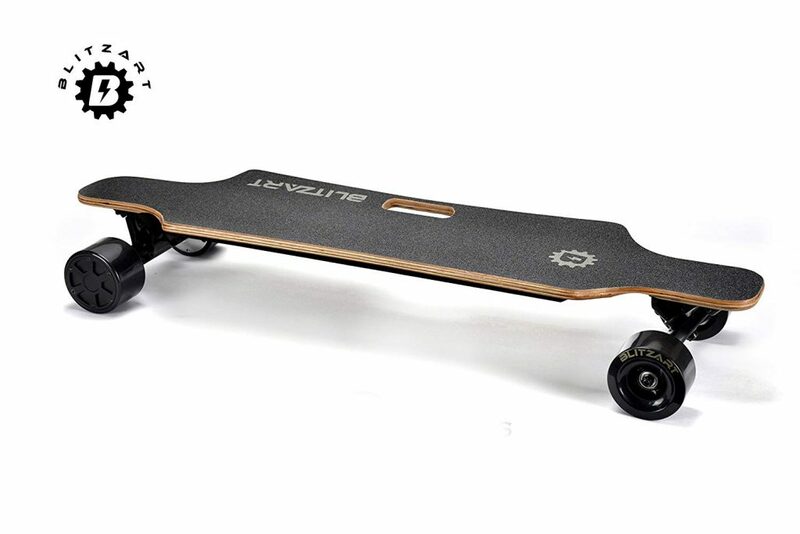 0.59 inches thick, the thinnest e-skateboard; 3 inches off the ground provides stability and control. 37 inches longboard, 8.7 inches wide, weighs 14.5 pounds and can hold a maximum load of 200 pounds. Powered by high-performance 380w x 2 motors giving it a 9~11 miles range with a top speed of 22 mph. 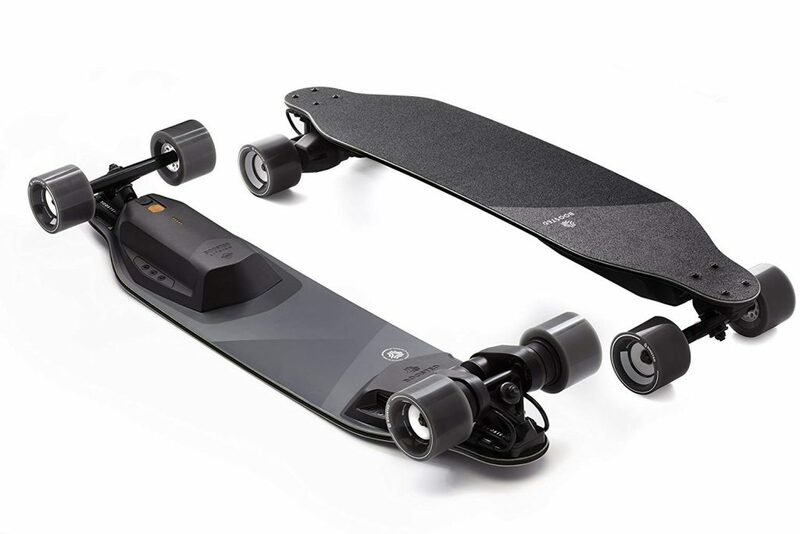 Right off the bat, we love the sleek design of this super electric board from Boosted. The smooth wooden deck has natural suspension that makes for a comfortable ride. The black graphic design looks slick day and night. And its suitable for riders of all levels. This electric skateboard is all about clever design. The Boosted board is light and compact, which makes it ideal for carrying with you on commutes to work or to meet your friends. What we really appreciate is the solid kick-tail, not all modern boards have it anymore, but it makes such a difference to your control. Add the carry handle at the top of the deck, and this electric board is a pleasure to ride. Now for the real kicker. The Boosted board is powered by reliable Samsung batteries that will take you up to 20mph for a range of 14 miles. On top you get a 3-mode speed control including a hill booster, perfect for all terrains. The motor and battery are cleverly concealed. Most people looking at this automatic board would never guess it’s electric, so you’ll look like any other pro skater. One drawback is the battery life. An average range of 7 miles won’t last long if you’re out for an epic ride. We recommend swapping for the extended life battery right off the bat. We love grabbing a Go Pro and taking this baby for a spin. So far we've racked up well over 200 miles. The board isn’t showing any signs of fatigue and looks brand new. If you use it to get everywhere in the city instead of expensive cabs, it’ll save you money - big time. If you’re looking for an extra sturdy board to take you around, this new board by BLITZART fits the brief. We love the strong feel of the deck and this board can definitely sustain a few knocks and kicks. If you’re looking for a great quality board that you can take out every day, this is the best value you’re ever going to get. This board is so easy to control that you can get the hang of it even without an ounce of experience. It has a maximum speed of 23mph and range of 11 miles. That’s more than enough for kicking back in the skatepark or cruising around the streets. The dual motors pack enough power for climbing hills with ease. We loved riding this board so much and only wished that the battery lasted longer. A quick call to customer service later we discovered it can be replaced. It’s a small complaint as all in all we were impressed. This board is perfect for most riders who want to feel the stability. It looks stylish and the wide deck makes it comfortable to ride. Once the battery dies, the design of this board makes it easy to continue skating. 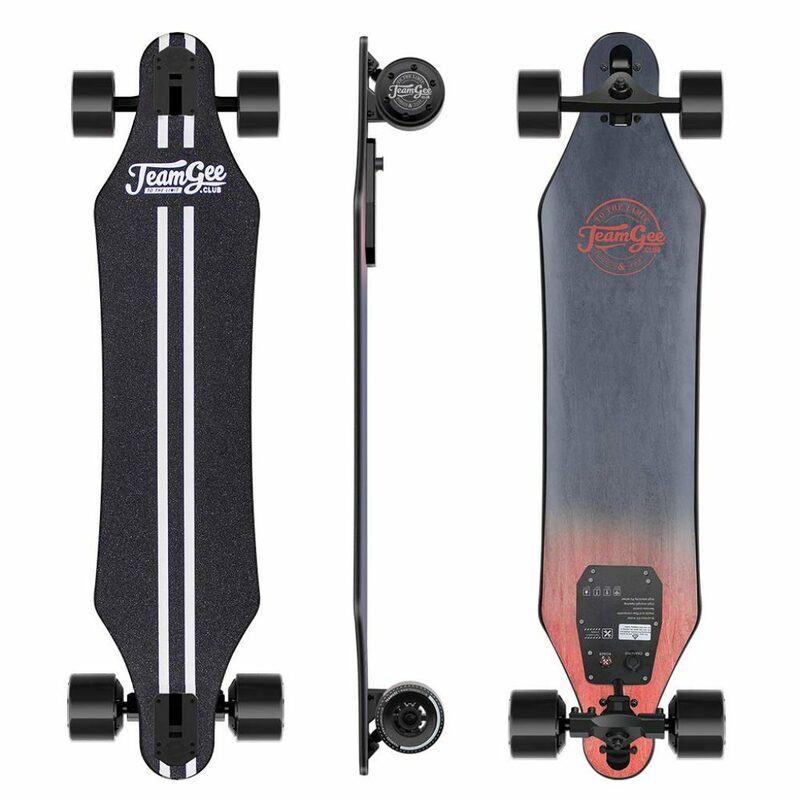 This is techy board is another great choice for new and experienced riders. The new TOMOLOO comes with all the features you would want. It has the power and traction to conquer on and off-road tracks. The board is powered by a motor that can take you the distance and at fast speeds. There’s a lot to like about this super electric longboard. The modern blue lit design is inspired by Norse mythology and enough to make this e-skateboard stand out of the crowd. But it’s not all about the looks. The board is made from high quality dense wood and other impact resistant materials. 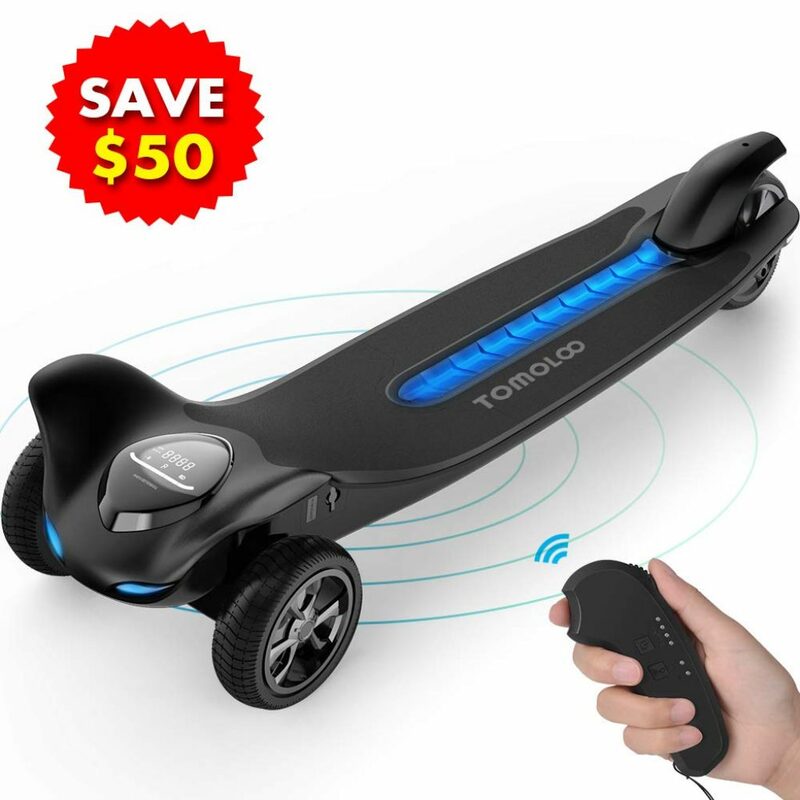 It incorporates state of the art self-balancing technology, keeping you steady even at fast speeds. The max speed is 17.5 miles an hour and you get 3 x riding modes to adjust your ride. The TOMOLOO electric longboard is a little heavier than the others we tested. It’s manageable but something to bear in mind if you’re using it for commutes, for example. Overall this board was by far one of the best boards we tested. Our in-house skaters love the combination of classic skating fair and modern features. We're always finding an excuse to ride it. If you liked this page then check out some of our other trending reviews on The Gadget Nerds.